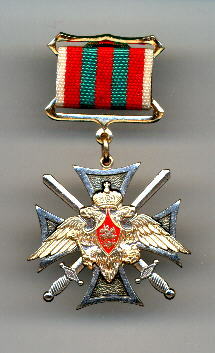 One of the most beautiful and perhaps the most controversial Russian awards, awarded to soldiers for action against their own people. The medal is still quite rare. Reverse text states, "For Service in Caucasus." Chechnya used to be a former part of the Russian Federation. Located in north Caucasia, it has an area of 19,300 sq./km. (7,452 sq./mi. ) and a population of 1,006,000 (1995 est.). The capital is Grozny. The dominant ethnic group are the Chechens, a Caucasian-speaking people who are traditionally Muslim in religion. Chechnya has petroleum, chemical, and lumber industries. Annexed by Tsarist Russia in 1859, Chechnya was part of the Chechen-Ingush Autonomous Republic during the Soviet period. With the breakup of the USSR in 1991, it declared its independence under Chechen leader Dzhokhar Dudaev. Chechnya and Ingushetia were separated in 1992. The Russians refused to recognize Chechnya's independence, and in December 1994, Russian forces invaded the republic. They met with strong resistance. After months of fighting and many thousands of casualties, the two sides agreed (July 1995) to a formal cessation of hostilities, but sporadic warfare continued. Dudaev was killed in April 1996, and a second truce was concluded the following month. This medal was widely discussed at a meeting of the Russian Government Council on Awards, because this was the award for killing tens of thousands of innocent Russian citizens. Eventually it was decided that fulfillment of a soldier's duty had to be recognized, irrespective of the circumstances.